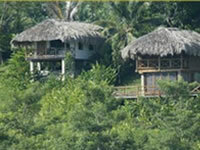 The Indian Creek Lodge is a comfortable jungle lodge located on a private nature reserve. It is surrounded by two large freshwater lagoons, which are attracting egrets, herons, cormorants, and other exotic bird life. The lodge also has some interesting Mayan Sites nearby; Nim Li Punit (Big Hat) is a small but significant site with many carved monuments and Lubanntun (Place of Fallen Stones) was a major Maya trading center of the region! Indian Creek Lodge features a lounge, a bar, and a dining area situated at the base of a low hill while the twelve cabins are dotted along a winding stone path leading to the top of the hill. Local artisans built the thatch-covered cabanas and the stone walkways. Each cabin is nestled in a grove of trees and tropical flowers, and has a private veranda with a view of the nearby savannah and the rainforest. This only resource of power at Indian Creek is a generator and therefore, it has limited electricity and no power between 11 :00pm and 6:00am.